Stop the presses! The Visage night train has kept hurtling forward while our attentions have been elsewhere during last few months’ preoccupications and this month’s deep plunge into Simple Minds full career. I still have not yet gotten the CD singles for “Hidden Sign” and “She’e Electric” that were released last Spring/Summer while I was furiously earning money for my vacation last October. Yesterday, out of the blue, I just happened to visit the Visage home page, and my senses were assaulted by a veritable explosion of activity. On Monday, November 24th, 2014, the band released their third single of 2014, a newly recorded take on their classic “Fade To Grey” recorded with the Czech Synthosymphonica Orchestra, whom they collaborated with in March of this year at a special concert remarked on earlier. The CD single has already sold out and is being repressed according to Visage HQ. I know what you’re thinking. “Eight more versions of ‘Fade To Grey…’ just what the world needs!” This is nothing so facile as a quickie remake of an old hit [though that can be fun]. 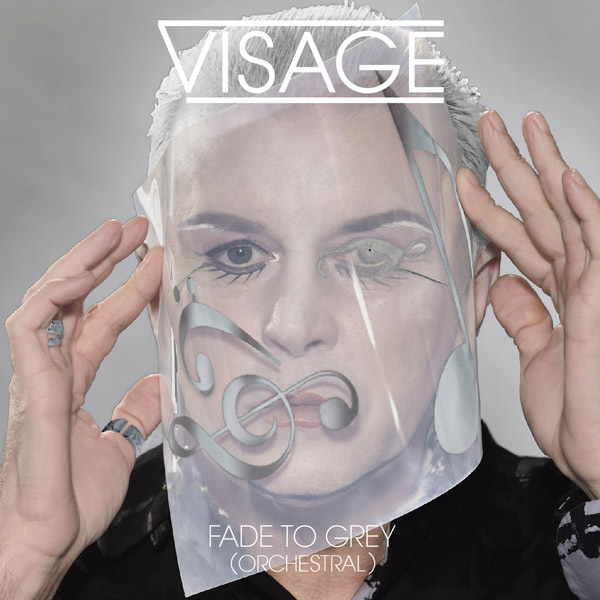 It’s also the pre-release single for the new Visage album. What’s it like? I’d call that fairly luscious and emotive for a start! Given that the formative genesis of the song was that it came together at soundchecks when string/synth artists Billy Currie and Chris Payne were touring with Gary Numan in 1979, it always had latent orchestral DNA in its veins. I’ve heard this song pushed and stretched in many different ways in the last 34 years and I have to say that I’m enjoying the fully orchestrated current mixes much more than the techno-fide 90s mixes, though they weren’t bad for that sort of thing. When I found out about the orchestral concert in the Czech republic I had hoped that it would reach fans ears and this has happened in the best way possible. 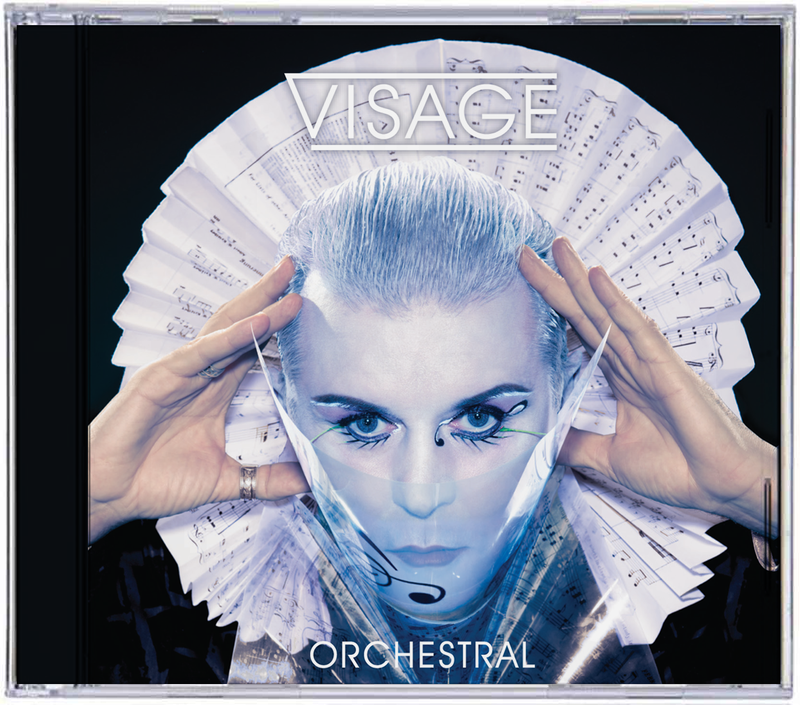 The album, simply entitled “Orchestral,” will be released next Monday, December 8th, and it will feature eleven Visage songs from their full discography given a real rethinking as well as “the Silence,” a new song added to the project to sweeten the pot. Presumably, this will be on the next Visage studio album that the band were reputedly writing for last Summer. The album will be available on CD and DL and there is a DLX package available in pre-order at the Visage webstore now that offers all of that and more. The second disc collects four mixes of recent singles that appear here for the first time. The third disc was part of the earlier “Hearts + Knives” package of 2013. Pricing is a relatively modest 20 and I have to have that 4-track promo so I’ll probably tumble for that one. Visage are doing such strong work that it feels right and proper to order from the band’s webstore for maximum karma. After all, I actually saw the “She’s Electric” CD single in Amoeba Records in October, and I passed on it there since I wanted to also order the “Hidden Sign” CD/12” from the webstore, and thought that I might as well make one big order when I scared up some cash. Well, the order just got bigger. I’m very happy to give top dollar for such enjoyable and sterling work as the band is doing right now. Fortunately, it’s not just all about filthy lucre and separating us from our hard earned shekels. It’s that time of year, and Visage is in a giving mood as well. When I went to their website yesterday, the screaming headline above the fold was the eye-widening news that just three minutes earlier [at least according to Steve Strange’s Twitter feed on the Visage home page] the band had released the 15 multi-track stems from “Fade To Grey” to the loving public in return for signing up to the Visage mailing list. Needless to say, I was on that puppy in a hot second! Since I have been buying from the Visage webstore, I was wondering why they did not yet have a mailing list, which makes being a fan a little easier. I see that this has been corrected and now I will get the news as it happens, not just when I get lucky and visit the website apparently three minutes after hot news like that hits the streets. One of these days, I need to lock myself into the Record Cell with the stems that I have from various kind-hearted acts I enjoy [John Foxx + The Maths, OMD, Gary Numan, peter gabriel, Visage] and look into giving remixing a try. Goodness knows that I have heard enough remixes over the last 34 years to have a few ideas on how to approach the art myself. The Visage home page also features a mix upload link so this is the interactive future that David Bowie was so bullish on 20 years ago! I guess that Visage will probably share their faves on their Soundcloud page and who knows? If they like your remix enough, they may come a-calling when it’s time for another single remix. After all, that’s what happened when OMD released the stems of “If You Want It” in 2010. OMD fan Roger Erickson got to officially mix two of their later singles [“History Of Modern -part 1,” “Metroland”] after they liked his turn with the stems. Now that this burning Visage news has been shared, it’s back to the Simple Minds Rock G.P.A. tomorrow! This entry was posted in Core Collection, New Romantic, Want List and tagged Orchestral, Remixes, Stems, Visage. Bookmark the permalink. Echorich – Just in time for Xmas! This is a fantastic stopgap measure while the next album is in the writing phase. The Visage team is showing how its done. Got suckered into downloading the multitracks for FTG. They shouldn’t be called “stems”. Stems are when several tracks are combined into one to make mixing simpler, but less flexible. These are full multitracks, which is better. These are not the original 1979 recordings. They’re plastic new recreations of the originals. They’re lossy MP3 files for your minimal sound quality pleasure. JT – Hmm. MP3 multitracks are certainly not the greatest. I think that most of what I’ve bothered to get have been WAV files. Someone’s hedging their bets! I would imagine that Polydor [or whatever mega-conglom engulfed Polydor] owns the masters to the 1979 version so no surprise here that this is probably from the modern orchestral recording. I’d not unzipped the bundle [it could take years] so your insights were useful! Still, I would be most interested in hearing JT’s and The Monk’s take on this song!! chasinvictoria – Why not your own? You surely own a copy of Garage Band! Live a little! As for JT, he’s the definitely the most capable of us all and yet he looks askance at the files. Ironic, no?